I’m very excited to share this newest edition of my ‘A Chat With’ series for a couple reasons. 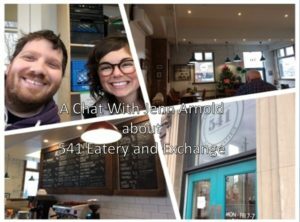 It features the always lovely neighbor of mine Jenn Arnold, who is one of the managers at 541 – and it’s about the awesome 541 Eatery and Exchange, a local eatery who do a lot for the community. 541 has been around for a number of years, but I’ve only just been able to experience for the past several months. They have great food, great coffee, and great community initiatives. Jenn was gracious enough to take some time before her shift began today to answer some questions I had about it. If you would like to learn more about 541 you can find them online at http://fivefortyone.ca/, and if after listening (or viewing their site) you would like to support them financially you can do so at https://www.canadahelps.org/en/charities/compass-point-bible-church/campaign/541-eatery-exchange/. Hope you enjoy, and God Bless my friends.